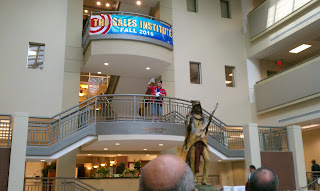 It is hard to believe that SQL Saturday 79 has come and gone. 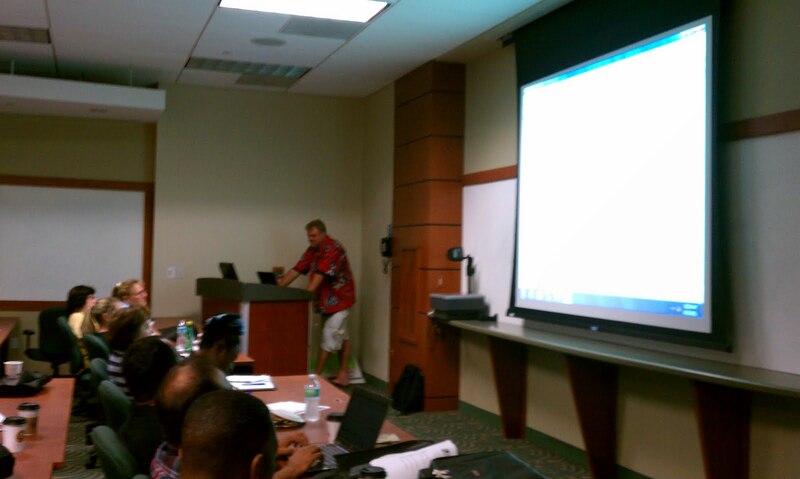 It was held in the Beautiful Carl DeSantis Building on Nova Southeastern University. The day started out with a 3:30 am wake up. I wanted to make sure that I had everything posted on the blog before I headed down so if anyone was looking for downloads or slides I could send them to the Resource Page for it. After a quick shower and grabbing a cup of coffee for the ride, I hit the road about 4:30 am. The trip down is 187 miles from the new house in Winter Haven to Nova Southeastern, with registration starting at 7:30 and the keynote at 8 I wanted to make sure to be there in plenty of time. It was a nice drive down, I always like watching the sun rise in the car. I used to see it all time during the drive in to DC & on vacations driving from Virginia to Florida before the move down here. So with the start of a beautiful day and a peaceful drive, I get to the parking garage and run into my good friend Kendal Van Dyke (@SQLDBA | Blog) on the way into the building. After finding registration, finding Coffee, and the restrooms it was off to the speaker room to get a Speaker Shirt. I don’t normally spend a lot of time in the Speaker room. I love to meet new people at SQL Saturday’s, but I didn’t make it down for the Speaker Dinner the night before so this was a nice chance to meet some of the other Speakers like Mike Hillwig (@mikehillwig | Blog), Herve Roggero (@hroggero | Blog) , Bradley Schacht (@bradleyschacht | Blog) and it was a chance to say Hi to others that I’ve met before. 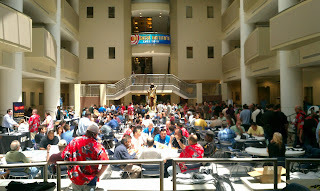 Andy Warren (@SQLAndy | Blog), Mike Davis (@MikeDavisSQL | Blog), Mike Antonovich (@MPAntonovich| Blog ), Jose Chinchilla (@SQLJoe | Blog), Rodney Landrum (@SQLBeat | Blog), and Thomas LaRock (@SQLRockStar | Blog). Tom LaRock made my day by remembering me. 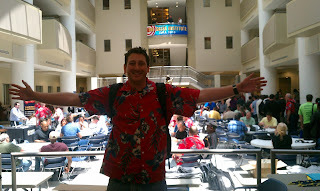 I have been very lucky and fortunate to meet some really awesome people in the SQL Community. There are a lot of people that I’ve gotten to hang out with on a regular basis (point’s to the list of names up above), that I just grin ear to ear thinking about. It wasn’t that long ago that I set in one of Tom’s sessions for SQL Saturday 49, and later read Noel McKinney’s(@NoelMcKinney | Blog) Blog about it. At the time thinking I want to get in on this, I want to present, I want to blog, I want to take the next step in my life as a DBA. And now I say “Hi Tom I’m Brad Ba…”, and he say’s “Hi Brad I remember meeting you before.” Awesome. Well Dear Reader, I missed the first one because I was reviewing all my presentations, cutting some material and adding a little more to others. But after that, I jumped right in! 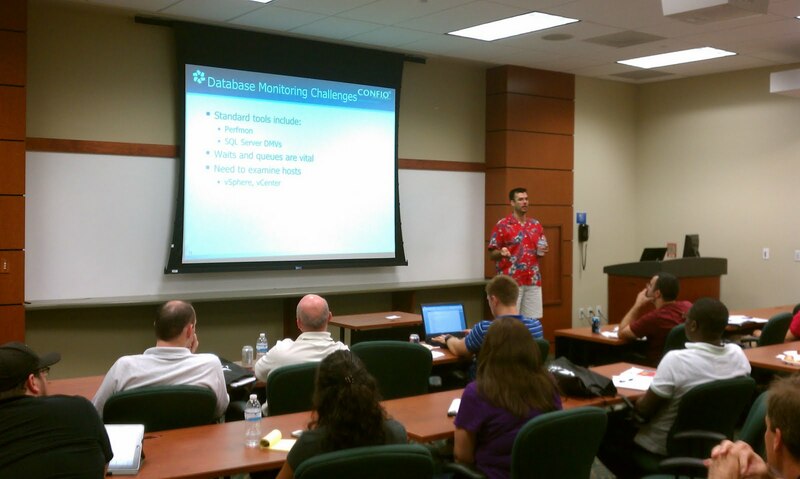 Rodney is a SQL MVP and has been working with SQL Server for over 12 years. There are four letters that describe Rodney’s T-SQL Alphabet Soup, no none of the dirty ones, A.W.L.D. 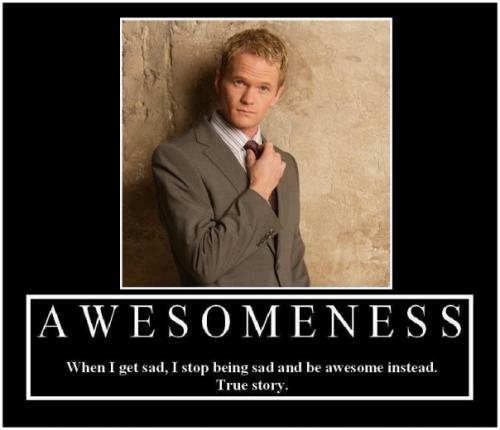 A is for Awesome, W wait for it, L Ledgend ……. D DAIRY. 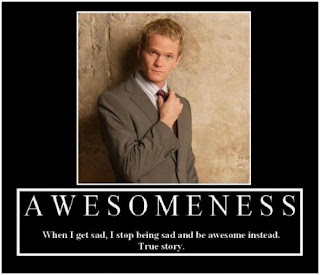 Ahhh…..Barney Stintson would be so proud. I would normally blog details, but Rodney’s Presentation is very interactive and a lot of fun. He goes one letter at a time and asks the audience to guess what command he will use. This is a great mental exercise for those of us that use SQL, and it is a lot of fun to participate in. And it will be one of the presentations given at SQL Saturday 85 J , CLICK HERE to look at the full line up for that great event. My Early Birds! We had another 15 minutes to fill the room after this picture! Compression is a great topic. Pictured above is my room as people started coming in 15 minutes before the session started. I had one of the best crowds I’d ever had. 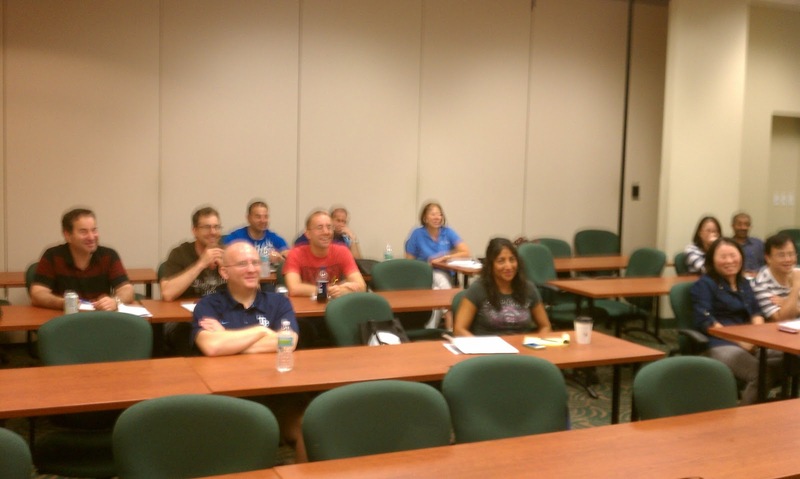 We cover a lot when I do this presentation, and I had a great group of people. 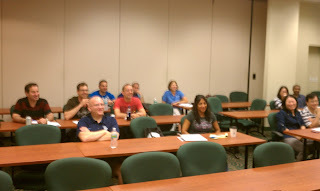 By the time the presentation got started we had almost filled the room. People asked questions, we had a really good back and forth. The main thing that I tell people is that when you apply Compression you do not want to do it blindly. I have a Monday Morning Checklist on my Resources Page and it lists all the steps you can take to determine the tables in your database that are candidates for compression. I like to think of Compression the way that you would Indexes. You wouldn’t just toss an index on a table and never check to see if it effected your query plans/query response times, over head for different operations (updates/inserts), or if the data was actually worth indexing. And Compression needs the same consideration to make sure you do it right. Compression is also very Dynamic, with the way that Allocation Units work within tables, Indexes, and Partitions you can apply Compression in a lot of different ways and we cover the full gambit. This was a great start on the presentations and I want to say a BIG Thank You to everyone who attended this was a lot of fun to present and you were a great crowd! Lunch was served by Azteca Real Mexican Restaurants and it was delicious. The line was vast, the picture you see above is after waiting for 30 minutes and then going to the back of the line, the sever table was on the opposite end from me. 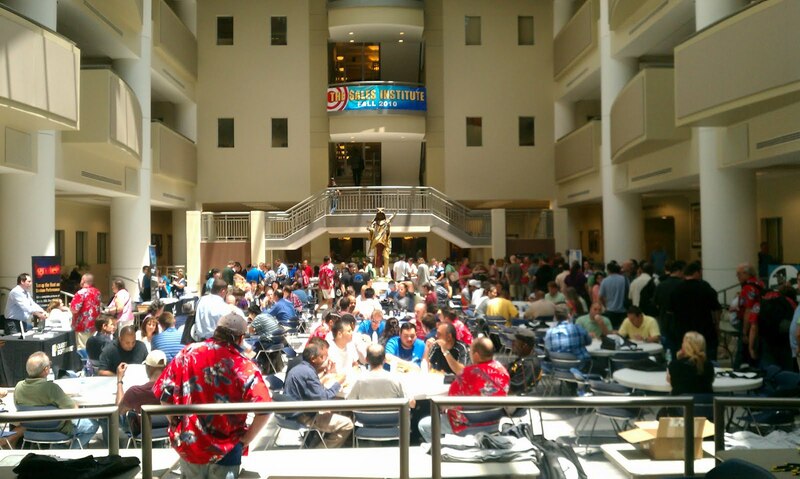 There were a lot of people to feed and the SQL Saturday team did a great job of getting everyone fed, with hefty portions. Quick thinking on their part led them to open a line on either side of the serving table to get the crowd through as quickly as possible. 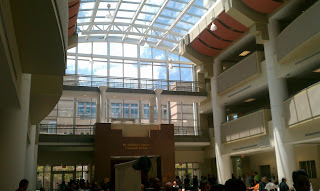 I chatted with folks in line, sat with Serge & Javier (two new acquaintances) and talked about the emergence of Business Intelligence, the free training offered by the Great Folks over at Pragmatic Works on a weekly basis, and a whole host of other topics. With my stomach full it was off to see a SQL Rockstar! I can’t speak for you Dear Reader, but I’m seeing a lot of Virtualization going on. There are some databases that will not translate well, that must have physical hardware. But these databases are normally the exception and not the rule. We all know that Virtualization is a great way to reduce your footprint, go green, yadda yadda yadda. So you’ve gone Virtual, now what. Now you are still going to have users coming up to you saying “The Application is running slow, can you fix the database?” And you will still need to ask the same questions. Slow compared to what? Do you have baselines, do you know how your server is behaving, Do you know how your Host & Virtualized instance are working in tandem? Ah I got you with the last one, and Tom got me as well. Tom does a great job of stepping through the different pain points that you have, CPU, Memory, Disk I/O, and Network Latency. These are all very important things to consider, after all they were important when it was just Physical Hardware. Now you have virtualized Hardware don’t you want to make sure that you know what is going on? The presentation is shaped around VM Ware. The terminology is specific to it and if you are running VM Ware and have Server Engineers talking about crazy sounding stuff like ESX Hosts, then you need to know crazy things like VM Ready Time, Reservations, Limits, and Shares. You need to know that Swapping and Ballooning can be bad, and if you understand how SQL Server uses memory it translates pretty quick. Tom talks about his (Patten Pending) BMFF Best Metric Friend Forever. And when it comes to troubleshooting your VM’s these are things you need to know. If your working with Hyper-V this is still a great presentation to attend because it will get you thinking about the questions you should be asking, and the terminology that you should be learning to better support your environment. I’ve worked a lot with Transparent Data Encryption. It is a great technology and was a great addition to SQL Server 2008. It is a very simple technology to turn on and off. And like my friend Colossus to the left it affects the Physical Structure only. During this presentation one of the cool thing we do is taking an unencrypted backup tossing it into a Hex editor and looking at the data you can start to pull out. The fact is there is a lot of meta data and header information, but there is also all of your other data stored in plain text. Then take that same database, apply Transparent Data Encryption, back it up, and place that backup in a Hex Editor. Aside from some header information that cannot be encrypted so that SQL can still read it, the difference is like night and day. We do that in this session and then I cover some tips on how to automate the backup and on disk management of your Certificates as well as the impact this will have on Advanced Features such as Mirroring and Log shipping, as well as the additional considerations you should account for when planning your DR strategy. Once again a very interactive crowd, and a very BIG Thank You to everyone who attended! Some of the most gratifying moments of the day came in the conversations after this session and my next one. BRADLEY BALL SQL INTERNALS, RECOVERY MODELS, & BACKUPS! OH MY! This was the first time I had done this presentation. My good friend Kendal Van Dyke sat in and gave me some great pointers for the next time I do this, and I’m really excited for next time. I think this is the year where a lot of things clicked for me and I grew the most as a DBA. I remember reading Paul Randal’s (@PaulRandal | Blog ) about the internal contents of a Page a couple years ago. And it took me several reads to process it to the point I could make flash cards on it. This year the internal make up of a Page has become familiar like the view out of a window. And as I’ve continued on with learning I’ve noticed that there are a lot of things that come up time and time again. Sometimes I stop and go, “How have I lived my WHOLE DBA life and not known this!” So this presentation is not about becoming an expert at internals. It is about getting to the point where you can start that journey. In it we covered ACID, SQL’s Internal Components, the Data Hierarchy, Transaction Log Internals, Recovery Models, how Recovery Models relate to SLA’s & DR scenarios, the different types of Backups, and what a Piecemeal Restore really does. I had a LOT of great questions. And even though I was able to answer all of them I think a lot of them deserve follow up blogs. 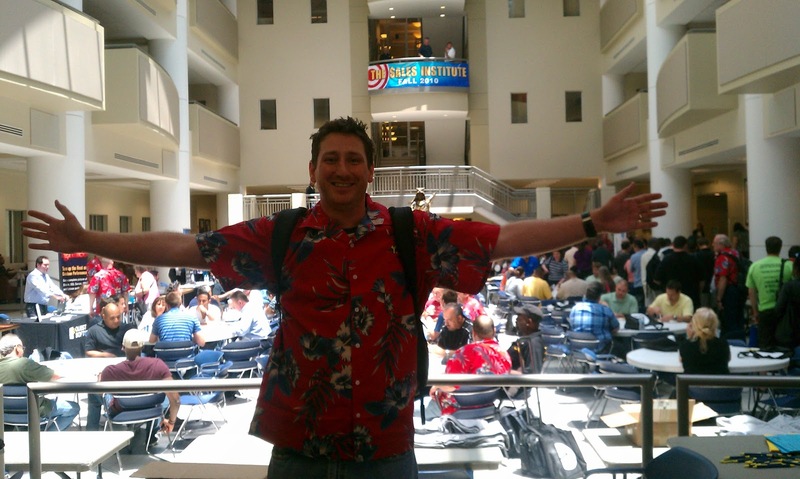 I pointed people repeatedly to the great free resources that are out there, How Do You Learn & Top 5 Reasons You Should Be On Twitter, and encouraged them to do free and paid training where they can. The point was to better themselves, which is always a good thing. Another BIG Thank You to everyone who attended this presentation. I had a great time, and really appreciated all the questions. After this presentation I had someone come up to me and say "I've been learning on topic X and the way you explained it everything just clicked and I got it." That is one of the best thing's I've ever been told after a presentation! And with that Dear Reader we called it a day. I sat and talked with Kendal, Andy, and Mike and watched as the raffles began. It was around 5 pm, a little under 12 hours since I had awoke, and I decided to call it a day, with a 3 hour car ride and another 187 miles to home. I got some Tweets about the after party, and I wish I had made it. Maybe next year we will make a family vacation out of this, or even better just me and Mrs. Balls, so we can stay a little longer. This was a great event and a great day despite all the difficulties the team hit during the day (10 speakers no showed the event)! We had a lot of great people that filled slots, the team worked tirelessly to get it all pulled together, and by the end of the day I saw a lot of smiling faces. I Can’t wait till next year. Now off to SQL Saturday 85 in Orlando September 24th J! Monday Morning Humor: Don't Forget Twitter!